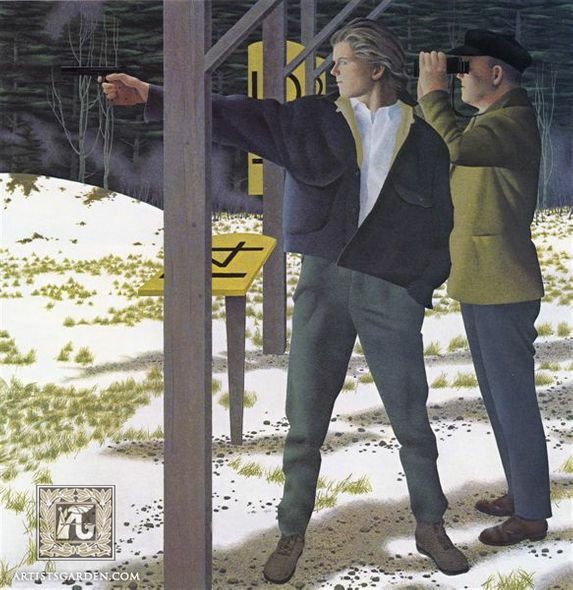 Alex Colville Hand Signed and Numbered Limited Edition Print "Target Shooting"
Image size:18 " x 17 3/4 "
About the Art: The practice of target shooting is one that engages many people as a means to develop their skills of concentration through physical and mental co-ordination. At one level, the literal level, this picture depicts the exercise of skill that can, in a sense, be compared with the skill of painting which also demands an acute sensitivity of co-ordination between eye and hand. At another level, however, the painting can be viewed as expressing the relationship between the two men whom we recognize as a father and his son. The image points to the sense of continuity between generations in which the older man comes to realize his position as a supportive figure, able to advise on the basis of his experience but where the responsibility for action has been passed onto the skills of the younger man, onto the next generation.